The median age in the Cleveland area is somewhere around 38 years old, which means well over half the population has never seen a championship. 52 years had passed since 1964, and there are plenty of people who grew up just suffering through heartbreak after heartbreak, each one different than the last. And now, today, Sunday night, June 26, 2016. And Cleveland teams have not lost in 11 days. For once, not because of bye weeks and off seasons. Since a week ago Thursday, the Cavs have won the two biggest games in franchise history, including the epic Game 7 against last year's champs in Oakland, California, and the Indians have ripped off 11 straight wins, opening up a five-game gap over last year's champs. 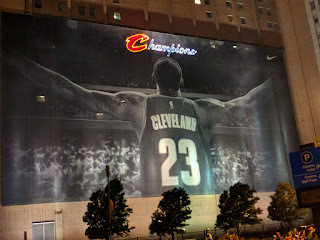 Just an amazing week in Cleveland sports that I have not been able to wrap my head around. I'm a child of the 80's and 90's, with the memories and scars that go with it. My orange spray-painted Webster Slaughter-inspired hightops could not help the Browns to a Super Bowl. My high red Thome-inspired socks could not help the Indians through the Braves' rotation or through a bottom of the 9th two years later. Everyone knows the refrain, drilled into our head through years of national and local media: Red Right 88. The Drive. The Fumble, The Shot, The Move, The Decision. But the pain was so much more vast, and yet deeper than that. Who hadn't felt like giving up after a gut punch, at one point or another. Up 3-1 in the ALCS versus the Red Sox? When Mark Price tears his ACL? When the officials give the other team a replay after a play was run? When two straight Cy Young award winners leave? When the latest quarterback fizzles quietly or implodes loudly? Merely another dreadful October football performance? Every Cleveland fan had moments they could recall--large or small--and where they were at the time. Pause for a second, and think about your own feelings about the Cavs chances after Game 2, or Game 4. Against a juggernaut that won 73 regular season games. Maybe nobody gave up, despite the haters in your office, on Twitter, or on ESPN. But the realism of winning three straight, or two on the road, versus these Golden State Warriors still felt like a faint chance. I've lived in Chicago for a few years now, yet told my boss before Game 6--if the Cavs win, I'm going to need the Sunday after Game 7 off, win or lose. Because I could just imagine the worst that could happen, and it's effect on my day-after. But when Game 6 went to the Cavs, I decided to travel to Cleveland to watch with my longtime friends, leaving my family after a Father's Day breakfast to head to Believeland, where thousands of people had gathered to truly believe. Walked through East 4th Street as the Indians pulled off a walk-off win last Sunday afternoon, and felt like a good omen. Had a beer on the roof deck of the Metropolitan hotel in bright sunshine, and things felt well in the Cleve. And then somehow the Cavaliers delivered. What an end to a strange season, where the team never seemed to be as loose as they should have been, at least until Richard Jefferson and Channing Frye showed up. A season where a legendary global coach, coming off a Finals appearance, is unceremoniously dumped in the middle of the season for a 39 year old first time coach. A season where the Big 3 was barely a Big 1 for most of the season, as Kevin Love could never match his statistical dominance from his Timberwolves days and Kyrie Irving recovered from last year's injury. A season where subtweets became headlines, and Twitter unfollows were interpreted for days. A team that lost late in the year to Brooklyn and had their young coach question their guts. A team that lost a deadly last game of the season in Chicago that could had damaged their confidence deeply heading into the playoffs. But then a team that turned it around and romped through the Eastern Conference. That was basically the script that everyone had written for Cleveland the whole year, that it would be an easy route to the Finals. But until it happened, I don't know if Cavs fans--or even NBA fans overall--really believed. The team really didn't hit a dominant stride until they finally did--with 10 straight wins and 12 of 14 to make it through the Eastern playoffs, and ample rest between series. Yet the haters remained. And then a team that came from the longest odds. A team to come back from a 1-3 deficit in the Finals, a feat that had never been done before. A team to win a Game 7 on the road, which hadn't happened in a long time. This team delivered to a hungry city a Championship in the way it deserved--full of angst, and against the longest of odds. With yeoman's efforts from all time greats, all stars, and backups and journeymen. The final two minutes was a massive justification of the Cavs moves and the city's belief. One of the greatest blocks in NBA history by LeBron. The most clutch shot in Cavs history by Kyrie, and the epic defensive stand by Kevin coming back from that three. The Big Three that was promised. So many memories from the week. 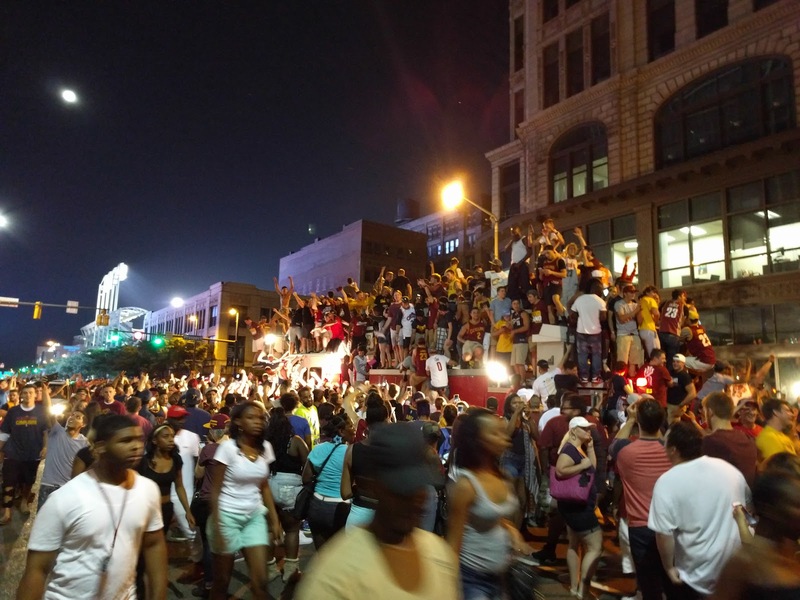 The scene in downtown Cleveland, free of violence, just massive amount of high fives and hugs between all ages, socioeconomic status, and ages. The CPD even complemented the city---a group of people just mobbed a fire truck, but the police radio told the story: "They're not being unruly, they're just really happy. "It was right outside my hotel, I stepped out into that scene, and couldn't put it better myself, if not the understatement of the millennia. 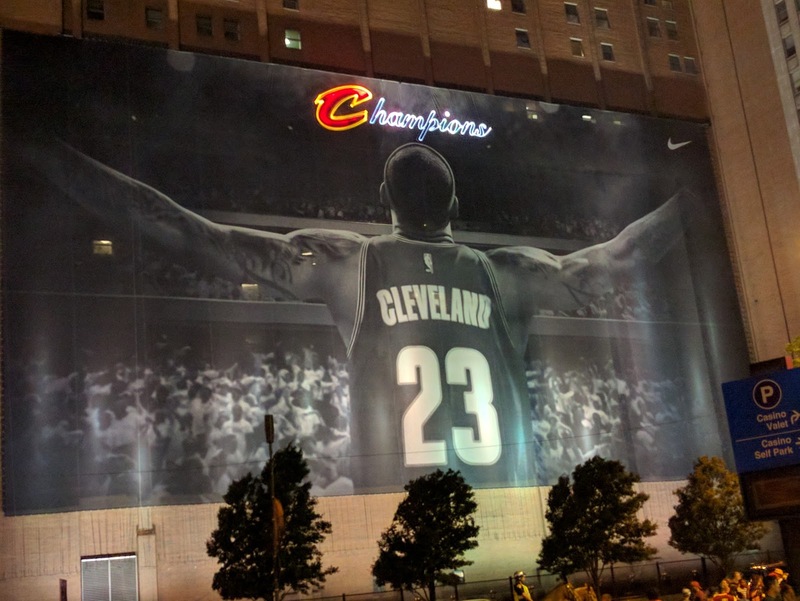 The Champion sign added to the LeBron mural. JR Smith losing his shirt in the Vegas club postgame, and not putting it back on yet. The players each with a different wrestling or Cleveland t-shirt. LeBron's epic trolling of Golden State coming off the airplane. The team's suddenly awesome social media, particularly Matthew Dellavedova, Channing "let's watch The Notebook" Frye, and of course Richard Jefferson's Snapchats all postseason with Lil Kev, which finally showed a team puzzle still wet with champagne. Thank you Cavs. Like more than one player said on the stage at the parade, this team is now linked forever. To each other, and in our hearts. God loves Cleveland. This week for sure.